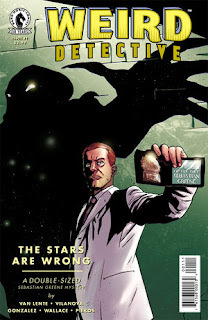 The Fellowship was fortunate enough to obtain a copy of WEIRD DETECTIVE #1 from Dark Horse Comics. Fred Van Lente writes, Guiu Vilanova draws, Mauricio Wallace and Josan Gonzalez color, and Nate Piekos of Blambot letters. Sebastian Greene is a NYPD detective, and a pretty good one. Too good, apparently, because the top brass has decided that he needs to be studied, so they assign Sana Fayez as his new partner. She’s a good cop, too, and soon the pair are neck deep in a very strange set of murders. But there is something going on with Greene, and his weirdness just might be tied to the case somehow. This double-sized first issue gives us some background along with the cool cop story. We get at least an idea of what Greene is (though I’m not spoiling it here) and we meet Sana’s family too. The story so far has some really solid elements of both crime and horror, and they work together nicely. And the art adds layers to both aspects too, with gritty crime scenes and creepy-as-hell monsters. I’m always down for a good horror comic, and this looks like the beginning of one, for sure. There’s also a “death by toilet” if that’s more your scene, so check it out either way. WEIRD DETECTIVE #1 is available now at your FLCS or at darkhorse.com.